OCC uses its new 350-ton (75-ton cushion) Beckwood hydraulic press primarily to deep draw fuel-tank sections (shown) and fenders for its Limited Edition Production Bike Line, launched in 2007. The company sells 150 to 200 production bikes a year, all manufactured at its 100,000-sq.-ft. facility in upstate New York. last August wide-eyed with excitement, and curious as to its capabilities. 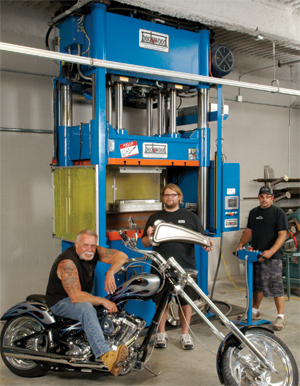 One crushed oil drum later (and a basketball and steel I-beam as well), it quickly set out to learn how the press, a custom build from Beckwood Corp., St. Louis, MO, could help the custom-bike builder move its outsourced deep-draw stamping work inhouse. Within a few months, the team, with help from Beckwood technicians, built a set of form dies and fine-tuned the drawing process, thanks in no small part to the flexibility and programmability of the press. As a result, lead time and productivity related to fuel-tank and fender stamping improved. “The ability to form and fabricate gas tanks and fenders inhouse was the final step we needed to take to optimize our production line,” says Jim Quinn, OCC’s general manager, referring to the company’s Limited Edition Production Bike Line launched in 2007. Each production bike is hand-built in the OCC shop using all-American parts. OCC makes 150 to 200 of the production-line bikes per year over six models, all of which share the same basic deep-drawn fender blank, and three fuel-tank designs. It then uses its five-axis waterjet-cutting machine to custom-trim the fenders for each specific bike model. Fenders are of 12-gauge draw-quality steel, fuel tanks of 14-gauge steel. In addition to the hydraulic press and waterjet machine, the 100,000-sq.-ft. facility—40,000 sq. ft. dedicated to manufacturing—also houses four Haas machining centers and two CNC lathes. “Outsourcing fenders and gas-tank halves meant we had to deal with the time and cost of shipping, which led to lengthy lead times when we made design changes,” says Quinn. The company expects to keep its production lineup fresh, with periodic design changes, and strives to keep its manufacturing processes flexible to accommodate new designs and requirements for new parts. It also, according to OCC founder Paul Teutel Sr., hopes to soon offer contract metal-fabricating services with its array of state-of-the-art machines. In addition to timing and flexibility, quality of the outsourced deep-drawn parts also had been a concern, and Quinn quickly learned how to tune the press and tooling to improve repeatability—forming parts with more consistency than he had been receiving with the sourced stampings. Better repeatability has streamlined downstream finishing operations. After bringing deep drawing inhouse, OCC worked with Beckwood engineers to fine-tune the drawing process and develop a custom draw ring to achieve wrinkle- and tear-free 14-in. draws on fender blanks, shown here. It also obtains a repeatable addendum shape that allows an operator to fixture, in just 2 min., each blank in the firm’s five-axis waterjet-cutting machine for final trimming. Fenders are 28-in.-OD half-donut shapes, 5.5 in. wide, with a 14-in. draw. “We use only 70 percent of the drawn blank in the actual fender,” says Quinn, whose background is in fineblanking and progressive-die stamping. He described the process used to develop the fender blank profile, and the “art-to-part” development required to eliminate the wrinkling and pinching into the upper draw ring that you might expect when attempting to develop a 14-in. draw. 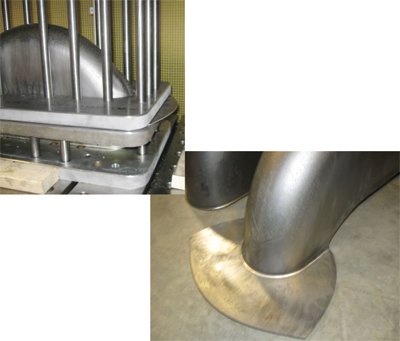 “A lot of art and trial-and-error development went into the project,” he says, “as we worked together with Beckwood’s technicians to finally obtain the part quality we were after.” Among the changes made during trial and error were the blank shape and the recipe for draw-ring pressure, so that by the fourth blank stamped, Quinn wound up with a usable part, and by the 12th blank the process was fine-tuned to form wrinkle-free parts. “The blank wound up being an elongated oval,” says Quinn, who started with a dog-bone-shaped blank. “Then, once we defined the optimum blank shape, one of the first process parameters we identified as critical was draw-ring clearance. As the fender would make its nearly-90 deg. turn up the side of the draw ring and around a 3⁄8-in. corner radius, the steel would start to tear. So we added another 1⁄16 in. of clearance in the deeper ends of the draw, which eliminated the pinching that was causing the tearing. “Then,” Quinn continues, “to eliminate the wrinkling we were getting in the middle of the part—the mounting area—I added side plates to the draw ring.” The draw ring is of 1.5-in.-thick 7075 Al; Quinn added 6 in. of flat stock to each side of the ring to smooth the edges of the fender as it draws down. After fine-tuning the tooling, Quinn then looked to use the multizone bed cushion (rated to 75 tons) of the press, which allows OCC to program and adjust draw-cushion pressure in as many as five different stages of the draw. At max, OCC uses 200 tons from the main ram and 66 percent of cushion capacity. Pressure is higher at the start of the draw, reduced in the middle of the draw and then increased again at the end. This dynamic cushion control throughout the stroke, in addition to programmable ram speed, “allowed us to really fine-tune the draw at its deepest point, between 12 and 14 in.,” says Quinn. The press is rated for a maximum draw of 16 in. In addition to dynamic cushion control, another key feature of OCC’s new hydraulic press is four-corner active leveling. Beckwood application and sales engineer Darrell Harrelson explains how the feature works and what it means to OCC’s applications. The last press feature noted by Harrelson is its use of a variable-frequency drive, growing in industry acceptance as a to “green” the stamping process. When the press is not running—and the nature of OCC’s limited run sizes causes a lot of downtime—the drive consumes only 50 percent of its rated energy, slowing from 1800 rpm during drawing to 900 rpm during idle time.